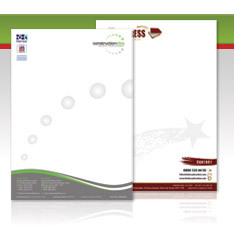 Your company letterhead design is possibly one of the most commonly used items of your business stationery and will be seen repeatedly by customers, so it is important to ensure it represents your company accurately. With our bespoke letterhead design service we will work closely with you to gain an understanding of your requirements and tailor our designs to meet your specific needs. We create all our letterhead designs bespoke, allowing us to be completely flexible, so as well as producing our own concepts and ideas if you have a vision, we can create it. To complete our design service we also offer your letterhead converted into an MS Word 2003/2007 template or first-class lithographic printing in full colour, available through our Appletree Print division. We can print on our standard 100gsm or luxury 120gsm bright white bond paper, or for an even more luxurious finish, we also provide letterhead printing on a wide range of Conqueror papers, including the ultra-polished, sleek to the touch Smooth/Satin collection and the natural and tactile Texture collection. We use the highest quality lithographic printing process to ensure quality is very high indeed. Your creative and corporate letterhead designer will talk in-depth about your requirements, taking into account any ideas you may have. Your letterhead designer will begin work on your letterhead design and email you the letterhead concept board within 48 hours. Once you have viewed the initial concept you may discuss any changes with your letterhead designer and he/she will continue to revise your letterhead design until you are happy (unlimited revisions). Once you have signed off the letterhead design, your letterhead designer will prepare for either print or send. If you have selected printing, your letterhead will be printed and sent to you. If you have selected design only, your final letterhead design will be prepared in high resolution print ready format and emailed to you.